We've been living with the solar system for a little over a year now and I thought it time to report back to you about the experiences we've had and talk about how the system is operating and performing. 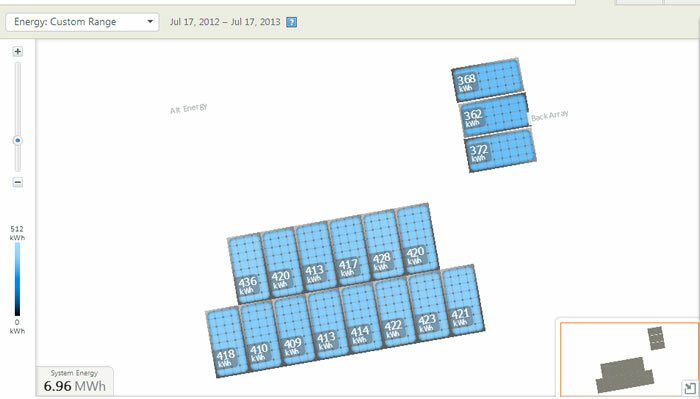 Well, we've been living with the solar system for a little over a year now and I thought it time to report back to you about the experiences we've had and talk about how the system is operating and performing. I am a mechanical engineer by profession so I've spent a large part of my life analysing the bejeebers out of systems and equipment. I'm not going to do that here because I don't think it really helps the average citizen nor do I think it's the be all and end all to making the decision to "Go Solar". The pure joy of knowing that we're generating electricity and helping with the environment is enough for me. Analysing efficiencies and minutae is for another time and place. To sum it up in a few words --- one of the best days of my life happened last month. First I got my annual --- yes annual --- electric bill from the utility company. After adjusting for the charges that were already there before the system was installed --- the balance for the year ------ $40 -- forty dollars -- four zero --- for the year!!! The bad news came later in the month when I heard about net metering discussions taking place that may change the ground rules for us. I'll wait for the final judgement on that one before I get crazy about it. If I have to pay a bit more to keep the grid healthy, so be it. All I ask is that the regulators ensure us a level playing field for the future. In the meantime, did I mention our annual electric bill was only $40? But wait a minute --- what about the ongoing costs of maintenance and upkeep. Oh yeah --- that amounted to --- nothing at all! No moving parts, no dust problems, no fuss no muss. The system just sits there silently generating electricity and turning the meter backwards. This one graph really tells us a lot about the system. The system performance has not degraded after one year of operation - on average, the peak energy is the same this year as last. This tells me that the system is operating just fine without any hand holding. 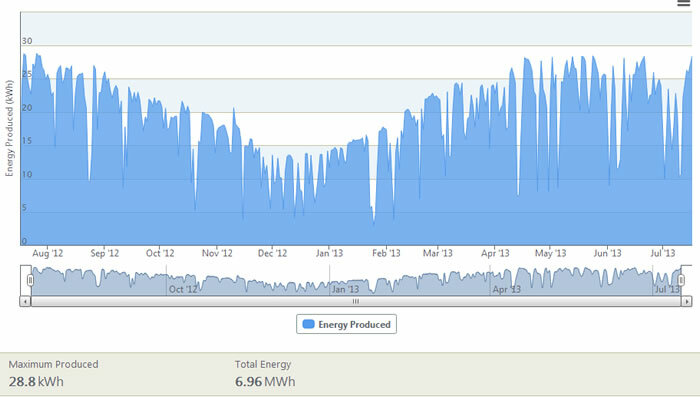 Our total energy produced for the year is 6.96 MWh. That's a bunch --- more than 5 tons of carbon offset just from this little old system. This one shows us the health of the system with each modules performance listed for the whole year. Major module malfunctions would show up quicly here. We do see however that the east facing array produces quite a bit less than the south facing array --- which is to be expected. But nonetheless --- it does produce a substantial amount of energy for us. So, what are some of the other benefits and what about the negatives. I get to brag to everyone that will listen about how much money we save and how good it feels to be an energy generator. The above bragging is resulting in others considering taking the step to add a solar system to their homes. With a few more energy saving projects to come around here --- I hope to bring our bill into the negative range next year. I'm thinking of buying an electric car in the future --- and I just happen to have a free source of charging for that too. Bottom line --- I think differently about energy now that I can generate it. I am even more concious of our use of it --- challenged by the goal of using net zero. And what about the cons! There has been a lot of talk lateley about the future of energy in this country. Fracking and drilling is back in vogue and the oil boys are telling us that there is no need to change because there is still lots of that crud under the ground and in the tarry oilsands of our neighbours in Canada (my homeland by the way). Do you want me to give you a list of the cons of going that route? Don't get me started. It is our responsibility to change the way we have been generating energy. No analysis necessary --- the facts are obvious and until we take care of the big picture there is no need to examine every nut and bolt along the way. Just get the journey started and the rest will fall into place as we "progress" into the future. We couldn't have done this project without the help of our sponsors and friends so please help us thank them by using their products and services.